But the case is about so much more than a drunken brawl. It goes to the very heart of the punishing, clan-like sumo system, one that is already reeling from accusations of bullying and match-fixing, and is facing waning public interest. 出典：Two sumo wrestlers walked into a bar. The brawl they had there is rocking Japan’s sumo world. The wider problem, however, and one that is getting little to no attention is the disconnect between the reality of sumo and the public’s perception of the sport. The underlying issue is a belief that sumo has somehow fundamentally changed since the beating to death of 17-year-old Takashi Saito in 2007. One cannot understate the scale of the cognitive dissonance at work here. A large majority of sumo fandom simply does not understand the true nature of the sport it follows. Boys and young men, initiated into a closed, secretive and violent Darwinian world, where their station in life is determined by an ability to physically dominate those around them, are expected to be the embodiment of fictional stoic samurai. That’s a presumption as unrealistic as the frog crossing a river with the scorpion on his back. These kids’ (and that’s all they are in most cases) lives are a zero-sum game where success depends on others failing. Less than 3 percent of all rikishi who ever join ozumo make it to the salaried ranks. For the rest, life consists of getting up early every morning and fighting (not sparring) for hour upon hour with those who share your living and sleeping space. The physical pain lessens once keiko ends, but the emotional and mental stress never does. Most people have heard about the getting up at 4 a.m. to clean toilets and waiting hand and foot on younger rikishi, but how many are aware of the constant bullying and harassment that goes on in several stables? Let’s be honest, I could go on listing far worse things I’ve personally witnessed or heard about from rikishi all day, but the point is, when you take all freedom, money and rights away from hormonal young men and expose them to constant physical and mental pressure, then the path of release for their emotions is often an unhealthy one. Sumo beya can turn into “Lord of the Flies”-like environments very quickly unless overseen by a strong stablemaster who knows how to use a firm hand as well as create outlets for all the pent-up rage and adrenaline. Oyakata like that, though, are too few and far between. 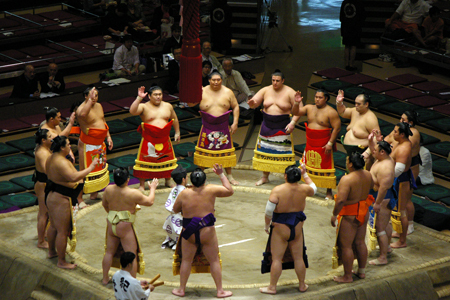 If sumo stables are like families, then they run the gamut from Von Trapp to Manson. The reality, of course, is that for many if not all of the stablemasters the only life they know is one that was even harsher. It takes a strong mentality to be able to enact change in a world that isn’t known for accepting it. Compounding the problem, a lifetime of repetitive brain trauma has left some elders clearly suffering from the effects of CTE. The concussion crisis plaguing football hasn’t yet reached sumo though, so it’s doubtful most are even aware of the issue. It’s hard to see sumo fundamentally modifying either its nature or the stable system — something that has existed in more or less its present form for hundreds of years — that is unless the Harumafuji incident gets turned into a power play by Takanohana. Soon after he became a sumo elder, the former yokozuna talked freely about dramatically reworking the sport, abolishing heya and giving rikishi freedom similar to professional athletes in any other sport. So strong was the reaction though that he soon backtracked on those ideas, but one gets the sense Takanohana never truly abandoned his reformist notions and if he does become rijicho, expect to see widespread and sweeping change. Until then, though, it would be good to see a little less outrage and indignation when modern-day gladiators fail to prevent the aggression they are trained day and night to develop, from spilling over into their lives outside the ring.